You can change the look of a line shape by changing its color, line style, or weight. If you are using Excel, Outlook, Word, or PowerPoint, you can apply a predefined Quick Style to quickly change the look of your line. Note: These features are available only in the desktop versions of the programs listed above. Quick Styles for lines include theme colors from the document theme, shadows, line styles, gradients, and three-dimensional (3-D) perspectives. When you position your pointer over a Quick Style thumbnail, you can see how the style affects your line. Try different Quick Styles until you find one that you like. Select the line you want to change. On the Format tab, click the Quick Style you want. To see more Quick Styles, click the More button . Note: If you don't see the Format tab, make sure you've selected the line. On the Format tab, click the arrow next to Shape Outline, and then click the color that you want. To use a color that isn't a theme color, click More Outline Colors, and then click the color you want on the Standard tab, or mix your own color on the Custom tab. 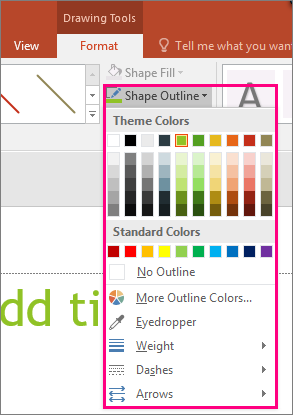 Custom colors and colors on the Standard tab are not updated if you later change the document theme. On the Format tab, click the arrow next to Shape Outline. Point to Dashes, and then click the style you want. To create a custom style, click More Lines, and then choose the options that you want. Point to Weight, and then click the line weight that you want. To create a custom line weight, click More Lines, and then choose the options that you want. Note: To draw a double line, draw a single line, copy and paste a second line next to it, and then group the two lines. You need to have a Gantt chart open to follow these steps. Right-click the line you want to change and click Properties. 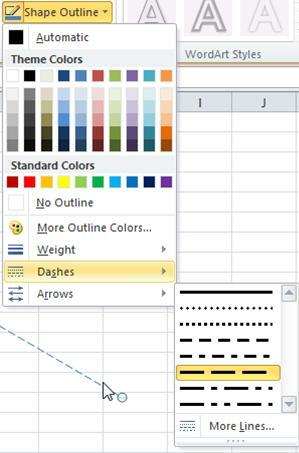 Under Line, choose a color from the Color list and a line thickness from the Line list. Quick Styles for lines include theme colors from the document theme, shadows, line styles, gradients, and three-dimensional (3-D) perspectives. Try different Quick Styles until you find one that you like. With live preview, when you position your pointer over a Quick Style thumbnail, you can see how the Quick Style affects your line. Under Drawing Tools, on the Format tab, in the Shape Styles group, click the Quick Style that you want. If you do not see the Drawing Tools or Format tabs, make sure that you have selected the line. You might have to double-click the line to open the Format tab. 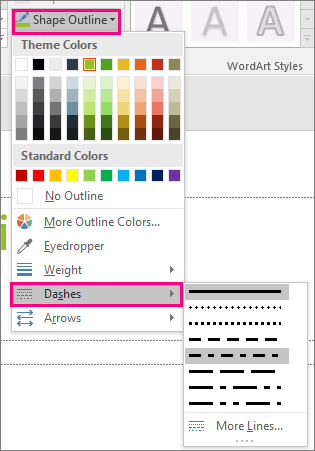 Under Drawing Tools, on the Format tab, in the Shape Styles group, click the arrow next to Shape Outline, and then click the color that you want. Example of the Shape Styles group on the Format tab. To change to a color that is not in the theme colors, click More Outline Colors, and then either click the color that you want on the Standard tab, or mix your own color on the Custom tab. Custom colors and colors on the Standard tab are not updated if you later change the document theme. 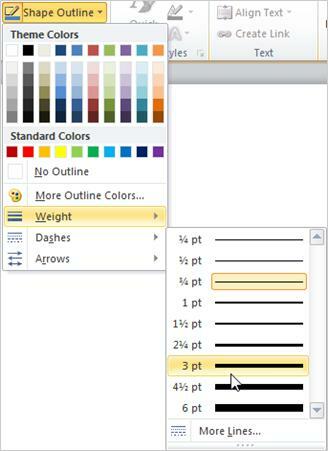 Under Drawing Tools, on the Format tab, in the Shape Styles group, click the arrow next to Shape Outline. If you do not see the Drawing Tools or Format tabs, double-click the line to make sure that you selected it. Important: Quick Styles are available only in these 2007 Microsoft Office system programs: Excel, Outlook, Word, and PowerPoint. Quick Styles for lines include theme colors from the document theme, shadows, line styles, gradients, and three-dimensional (3-D) perspectives. Try different Quick Styles until you find one that you like. When you place your pointer over a Quick Style thumbnail, you can see how the Quick Style affects your line. If you want to change multiple lines, select the first line, and then press and hold CTRL while you select the other lines. For more information about selecting lines, see Select a shape or other object. To change to a color that isn't in the theme colors, click More Outline Colors, and then either click the color that you want on the Standard tab, or mix your own color on the Custom tab. Custom colors and colors on the Standard tab are not updated if you later change the document theme. If you do not see the Drawing Tools or Format tabs, double click the line to make sure that you selected it. Note: To draw a double line, draw a single line, copy and paste a second line next to it, and then group the two lines. For more information, see Group or ungroup shapes, pictures, or other objects. On the Drawing toolbar, click Dash Style , Line/Border Style , or the arrow next to Line Color , and then click the style that you want. 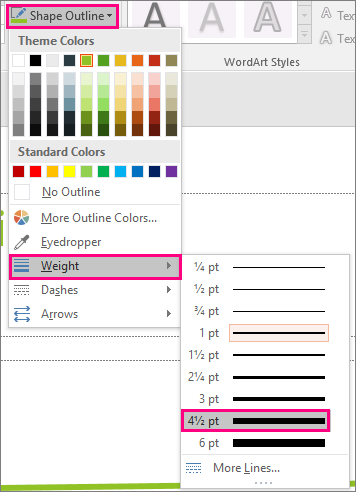 To change to a color that is not displayed, click More Outline Colors, and then either click the color that you want on the Standard tab, or mix your own color on the Custom tab. To create a custom weight, click More Lines, and then choose the options that you want.